The following summarises the key messages derived from the experiences and observations of the growers featured in this booklet and reflect the prominent topics of discussion amongst those growers who undertook the bus tour. The need to effectively manage soil acidity, especially sub-soil acidity, is widely accepted as being essential to farming profitably in a drying climate. There is a trend towards higher rates of lime and more frequent applications in order to reduce the time taken to increase soil pH at depth. There is strong interest in incorporation techniques capable of reducing the time taken for applied lime to increase pH at depth. There is a conflict between the need to incorporate lime to maximise its affect at depth and the desire to retain the soil structure benefits obtained through many years of minimum or zerotillage practices. ‘Top-soil slotting’ shows promise as a technique to move higher pH topsoil down the profile, but more research is required to refine the system. The use of alternatives to lime sand, such as ‘Morell lime’, become increasingly viable as distance from the coast increases and as high grade lime sand becomes scarcer. Managing soil acidity is a key component of effective weed management. Regular soil testing of both topsoil and subsoil is essential to manage pH and nutrients. Acidification is on-going and is part and parcel of a productive system which exports food or fibre. The more productive and higher the leaching environment the greater the acidification rate. Effectively managing weeds at the lowest cost possible is a very high priority for growers. Integrated weed management incorporating harvest weed seed management, effective in-crop weed management and the elimination of point-sources of weeds is essential for the management of herbicide resistance. There is an increasing trend towards a ‘no escapees’ approach to managing weeds, particularly those susceptible to the development of herbicide resistance such as annual ryegrass and wild radish. This includes removing isolated trees, rock piles, contour banks, fence lines and other point-sources of weeds. Summer weeds are becoming increasingly expensive and time consuming to control, with some such as button grass (Dactyloctenium radulans) and tar vine (Boerhavia coccinea, Boerhavia dominii and Boerhavia schomburgkiana) becoming more prevalent. When coupled with spot-spray technology, chemical fallow is becoming increasingly accepted in the low rainfall areas where moisture capture and the ability to sow early is critical, but has less acceptance in higher rainfall zones. There is significant interest in the research being undertaken into residual herbicides for chemical fallow. Sheep are seen by many growers as incompatible with effective weed management, while in contrast, some growers see sheep as an essential tool for managing weeds that are difficult or expensive to control with herbicides. There is increasing interest in hand weeding wild radish once numbers are low. Global Positioning System (GPS) technology makes this more viable by allowing the accurate mapping of isolated plants and residual populations. Overcoming soil acidity is a key component of effective weed management. Using mouldboard ploughs to bury weed seeds can be an effective way to manage herbicide resistant weeds, but can introduce significant issues with seed depth control, surface crusting and trafficability. Harvest weed seed management practices vary considerably between growers and it is common for growers to use different practices from season to season in response to crop biomass levels. 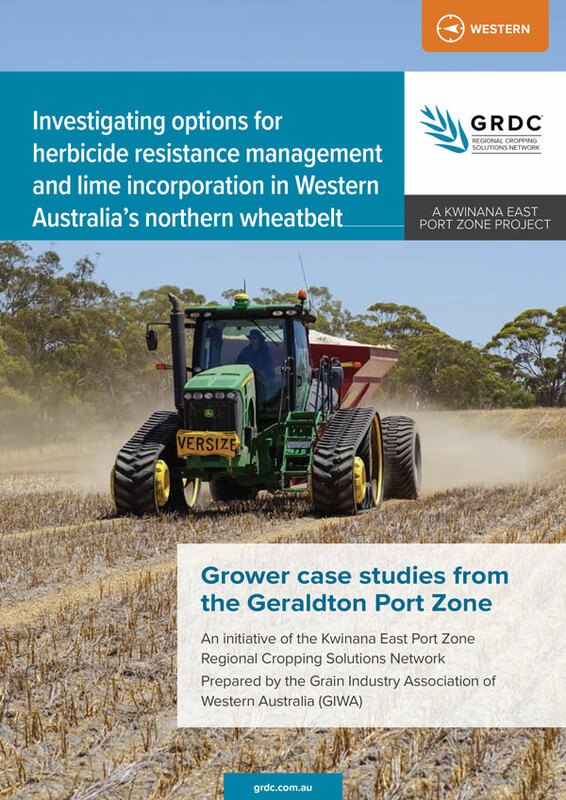 2.88 mb Investigating Options for Herbicide Resistance Management and Lime Incorporation in Western Australia's Northern Wheatbelt Grower case studies from the Geraldton Port Zone. An initiative of the Kwinana East Port Zone Regional Cropping Solutions Network Prepared by the Grain Industry Association of Western Australia (GIWA).